Your garden is absolutely stunning Heron - I LOVE it! Another beautiful section of your garden. Great planting. It's lovely, you've still got a lot of colour there Heron. Yes Louise I still have lots of colour, especially Roses, but I confess that this photo was taken earlier. How long has it taken to create this beautiful garden of yours Heron? - I'm impressed by the quantity of great planting just in this corner alone. Hey guys , anyone get the impression this ones not a beginner? Lovely garden H a real delight to the senses! Lovely garden with plenty of interest. What a beauty Heron, i love it. Thank you all for your nice comments, they are really apreciated. your garden looks gorgeous Heron..Can I see Mow Cob in the distance? Wonderful garden ,you must be so proud. Your garden is so beautiful. I'd love to acieve something like that! What gorgeous planting, and I love the way the rocks look so natural! Congratulations. Oh, this is incredible! so colorful. Perfect color, balance, and so exciting to the eye. Love it! Thanks, I really appreciate your kind remarks. Just discovering your pictures, your garden is a delight, the colours are enchanting. What a wonderful combination of stone work and plants, it's such a delight to the eye ! A lovely garden, a picture to inspire others. Many thanks Janey, I hope it will look as good this year as I've placed an urn where the Cotinus was as It became diseased. Yes they are Crocosmias but I've moved them further back. I'm always changing things around as It usually improves things. I'll try to remember to re-take the pic this year to compare. 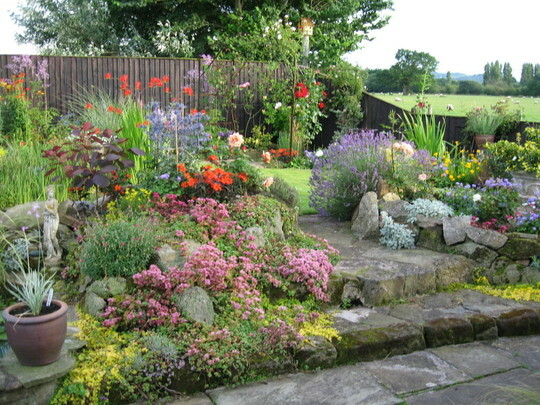 After looking at this photo I think I might shelve my intended project of building a rockery this spring. It amazes me what some people can achieve , so with luck and lots of references to your pictures perhaps I might just get somewhere near achieving my goal. Anyway thanks for your beautiful photo. Thanks for those very kind words Stroller. I have to say that it's not at all planned, in fact quite the opposite. I never do 'plans' as I like the 'natural' effect. Often a 'planned garden' looks planned, nature doesn't use a plan. Well that's my excuse anyway. Please don't be deterred Stroller, just remember to keep it 'natural'. Colour is fairly important but size is more so. The best way to plant Daffodils is to throw them to the ground and plant them where they fall so just decide where you want a rockery and lob your soil/rocks randomly. Walk around the garden occasionally to see it from different angles. When it looks right it is right. When choosing plants (there are so many) avoid those that die off after flowering (apart from bulbs) so that even when there's no colour you've still got shape/form. Go on have a go !! OH me goodness! WhY do we live so far apart! I would love to sit in some tree and just unseen and unhindered, enjoy the view of this peaceful garden! aaaahhhh, tis soo lovely! Very beautiful! You, like me, have sheep nearby too. You're very lucky, I love what you've done! Yes sheep are nice to look at, amusing too. This year the farmer told me that they'll be giving birth in the field next to me rather than at the farm. She said this particular breed do it like shelling peas. This morning I was chasing one down the lane (again) talk about Houdini. Lol. Awww, how sweet, I would of loved to of been there. You've sussed it Gary, definately no planning. I just registered on this site to say this garden is amazing. I'm a total amateur and have a sloping garden which for the last 10 years haven't seem to get the knack of getting it right. Looking at this has inspired me to get it right. Would love to know what plants you put in and what can I use instead of flag stones as I've got 2 toddlers. Once again, brilliant colours. Zee, you flatter me. Your sloping garden could be perfect for getting the effect you want as it's sloping. A written description would be helpful but a good start would be to un-flatten it. Get some rocks even old railway sleepers and create some level bits. A snake path would also break it up. As for planting, don't go for stuff like lupins, go for alpines and shrubby plants like Rock roses. There are so many plants that would do the trick but here's what's in the photo. Cotinus, Crocosmia, Lithodora Ceratostigma, Creeping Jenny, Artimesia, Tanacetum, Saxifraga and Blue thistle - sorry I've forgotten it's proper name. This is a beautiful garden Heron. Like a page from a gardening magazine. Perfect. Thank you Homebird, I've lost the Cotinus to some disease so it's a little different this year. The pic was taken mid-summer so I'll take another this summer. I've taken another shot slightly earlier than this one last year and as you will see the urn has replaced the Cotinus. Very Pretty Heron! Lots of color! Love those rocks too. Payag, thank you so much for all your nice words on my pictures, you flatter me, and thank you also for being the first to congratulate me on my Birthday, I see we share the same star sign (Libra). I hope you enjoyed your special day. Does 'Payag' mean small cottage? Yes Heron payag means small cottage where I live, we have another house in the city but I love to live here, I find it cute. I spent my birthday with my daughter, Hazel in church, then went to the shopping malls just whiling away the hours. How did you spend your birthday? Hope you too enjoyed it, Heron. Glad to hear you enjoyed your birthday Payag, wish I could say the same. Three weeks ago I had an operation for a hernia and so I had to spend the day like many other days sitting in my chair. y oh was at work but I had Barnaby for company so not so bad really. Not allowed to drive for another week yet, can't wait to get out. I saw your comment above that "nature doesn't use a plan" ...You have hit on the most wonderful objective a gardener can have...to make it look so natural that observers don't see the plan. I join the legions before me...lol... very lovely garden, and your philosophy is a credit to you too! wow,what a stunning picture,absoloutely beautiful ! What a lovely garden. You have some great plants & colour combinations included. The splashes of red look fabulous. I'm just beginning...can I ask how long your garden took to establish please? I keep coming back to this photo of your garden it is so nice I like the plants.